In order to stop the spreading panic, most of the detailed recounts of what is happening in Tibet are filtered out; however, a few blogs have survived to report what had happened at the frontline. In the propaganda sparring, each side has shown their best skills to stand their positions by the name of “people” on their banners. But given the records of people who have in person witnessed the violence and anti-violence by the means of crackdown, it's the thousands of commons who were hurled into a sea of infinite fear. I personally think the riot is quite successfully planned. Since 10 March, monks and nuns around Lhasa have entered downtown to protest, but were soon dispelled. Then, great hordes of police were sent to around the temples at suburb, thus the force available in city was limited. On 14th, 10 am, some started to siege the police outside the Xiaozhao Temple in the city, and the action soon turned into violence. 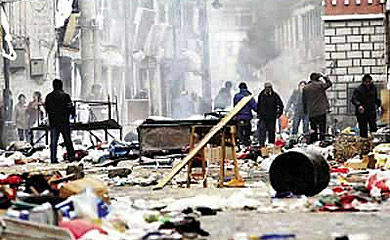 The whole city was then thrown into the insurgence. A very pretty feint. On the day of 14th, (mobs) killed every Han they met at where the riot was going. But the overall death toll was unreleased. However, my colleague’s spouse who worked in Public Security department told that about 170 Hans died. Then there was no more statistics. Hospitals in Lhasa were crowded with the injured. My friend working in newspaper office has been there and saw in person 5 people lost their ears and one body of a female burnt to death. In the police hospital, every a few minutes an armed police was sent in, as in daytime they could not crackdown by force but could just stopped the mob with flesh wall. By the way, I can tell you 2 cases of real violence: 3 Tibetans caught up a Han girl and each gave her a knife stab; another case —– 5 young salespeople were kept in a shop, door shuttered up and gas bottles thrown in. They were burnt to death. On 14th, the police were allowed to shoot at those who strike them. At 5 am, 15th, the army drove in with 40 wheeled armor cars. (That inspired us Han). And on 15th the police broke in homes for search. On 22; 00, 16th, the pedrail tanks withdrew, situation under control. But pieces of violence still existed. At 11 am, 17th, we were back to work. 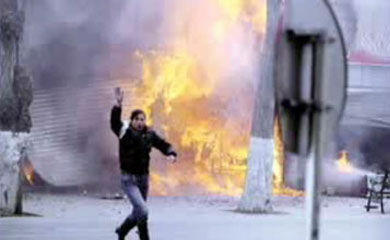 A girl working in Lhasa also recorded the day and night during the unrest. She kept using “scared” in a row. The whole afternoon was spent in panic. For a while we heard that armored cars had showed up…. for another while it’s said tanks came too, and then smoke rising at around Xiaozhao Temple. I dared not go out, and had no idea what’s happening outside. There was all noise —– screaming, guffaws, sound of chasing, 120 (emergency medical call) for twice and something blown up. The dinner, some soup left from lunch plus a few more dishes, is fine. It tasted so good! When at table I found quite more people, over 10 totally. Where did they come up? So strange. 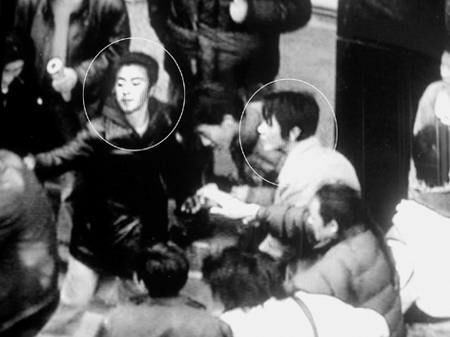 And there were 2 men from Sichuan, who seemed injured. The men said they hurdled the wall and observed the situation for quite a long time before skipping down to our yard. I was not sure if they were exactly the men beaten up howling when at dusk. We were so scared too, speechless, daring not to open the door for the fear that the thugs would broke in on hearing we are Han. I am too frightful to imagine that. I phone a Wenzhou girl staying at Pingchuo Youth Hotel for regard. She said the place was out of power. The only little food could be bought was so dear. She saw the doors of Pingchuo burnt at noon and so did the door of a bank nearby. The hotel owner was keeping watch downstairs and she was also scared. I comforted her for a while and ringed off. Actually I was scared no less. Staying with us were tourists, investors in Lhasa, and of course the owner of the house. Though no one spoke it out, I was sure every one of us was very scared. Very very very scared! One of the two found here a shelter said his motor was burnt along with the 20000 RMB cash and bills on it…. We told them it’s the personal safety that matters! They were robbed and beaten up, faces pale. Though I had not been with them at the time, when hearing this I still thought how lucky to have the care from the government. Imagine what would have happened then without the protection of the government? What would we staying in Lhasa be? They are both wanted by the government. Who are they? Martyrs or just killers? Finally, a wife is praying for her husband who had been sent to Tibet for crackdown. Two nights ago my husband marched to Tibet, and I know nothing about where he is now. The cell phone must have been out of power, contact lost. Qiu told that they were demanded to reach within 3 days. They should be there now. Gloomy…. I hadn’t read news a few days ago until my husband said he would go to Tibet. But it seemed to have nothing to do with our life. Well, now everything is different. My husband was sent to Qinghai to protect Tibet, exactly on the early morning of my birthday, a time He should have been here. On the day they set off —– we didn’t know it then—- we did shopping for rings and necklace. It’s good that we just spent about 7000 or I have to be sorry for the money for quite a while. I bought some for him too, but it doesn’t fit very well. However, we had no chance to ask for a change now. I have to wait until he is back. These two nights I don’t feel like to sleep until the TV shows made me extremely sleepy to midnight. So unaccustomed to the days without him, without a companion. Hope they can be fine outside, take good care of themselves, and I don’t know if they’ll suffer cold with the clothes I sent. How stupid that I forgot to bring him shampoo. How could he wash hair? Wish a peaceful Tibet coming soon, wish my husband coming soon. Blessing on Tibet, on my husband! They carry out orders. But what are their stories behind the cool masks? were the actions of the rioters justified? It’s hard to answer, due to how little information has been allowed to exit the region. Is the PRC’s media lockout of the event justified? Thank you. You are sooo careful! Hmm.. The Tibetans have a very good teacher in the Chinese Communist Party. During the 1967 Communist Riot in Hong Kong, the Communists did exactly what the Tibetans did: kill, loot, burn, bomb. And the leader of those Hong Kong riots was awarded with the highest honour in Hong Kong SAR after 1997. Tibetans are such good copy cats. it seems that westners dont care about people who died or hurted during the riot.they just care about what china gov failed to deal with in a perfect way,a way to cater for foreigners judgement. maybe the gov has to much to do to improve its crisis conmmunication skill,but the priority task is to protect citizen from further danger. what you have done in this issue? to boycott olympics? that’s nonsense.to fire a chinese flag? it is helpful to cease the riot? do you wish to see more conflict in this region? before ask any question,pls answer it first, are the rioters right or wrong? AND ITS NOT NEW NEWS ITS JUST COMMON LOGIC SINCE THERE IS LIMIT IN EVERY ACTION AND EVERY ACTION HAS REACTION.